Download a .pdf of this month’s SPC News. 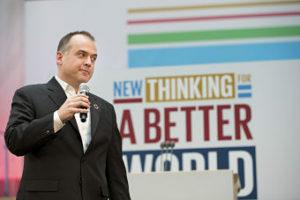 Mitchell Toomey, Director UN Sustainable Development Goals Action Campaign (SDG Action Campaign), at the Global Festival of Ideas for Sustainable Development at the World Conference Center (WCC) in Bonn March 03 2017. Shaping a just society: a place for a Christian worldview? In this April newsletter, we bring you articles on some of the key questions which should be asked by the community and its elected representatives. Peace in and between communities and countries is an essential precondition to a fully just world, and requires a strong moral underpinning, committed to the common good. Paul Rule comments on a critical look at the Just War theory, with a new emphasis on non-violence and a primary pursuit of peace. Caesar D’Mello argues for active non-violence as a means to sustainable peace. We are at a time when we see the Australian public – and the government – looking to give less than ever to the needy in other parts of the world. The aid sector fears the next budget will see further cuts in overseas aid, as the budgeting calculus embraces cuts in company tax rates. Public commitment to overseas aid NGOs is in decline, after adjusting for inflation. 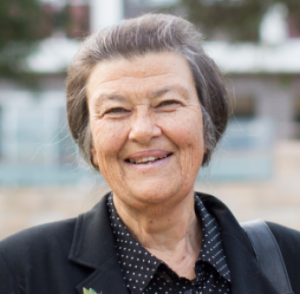 Libby Rogerson comments on two recent summits addressing the Sustainable Development Goals (SDGs). Why do the critical Sustainable Development Goals receive so little attention in Australia? Most Australians know little or nothing about the SDGs; even the Minister stated “many do not understand the SDGs, why we have them, and what they are for”. The President of UNAA, Major-General Michael Smith, was harsh in his criticism of the SDG process in Australia, saying “people don’t know about the SDGs, they think they are just for poor people”. He then went on to note that there is no PR campaign for the SDGs, no national plan, and no SDG champions. UNAA has written to all politicians, asking that the SDGs be embedded in all government policies. In a similar vein, Marc Purcell, the CEO of ACFID, urged government to model the implementation of the SDGs at home and have a national plan, while Sharon Smee from the International Women’s Development Agency argued for gender equality and recognition of the SDGs across all policies. 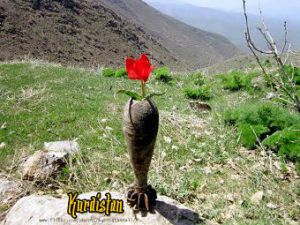 Kurdistan Kurds want peace. Jan Sefti. flickr cc. A little-noticed revolution has occurred recently in Catholic thinking about war and peace. Effectively, Just War calculus has been abandoned for a new emphasis on non-violence and a primary pursuit of peace. 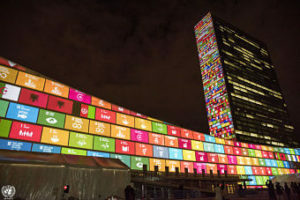 Projections on Sustainable Development Goals & 70th Anniversary of the United Nations. United Nations Photo. flickr cc. The SDGs call for a fundamental transformation in the economic, social, and political life of the world blighted by conflict, discord and inequality. While some voices propose violence as an answer to intractable issues, Pope Francis has urged us to foster “non-violence as a style of politics for peace”. To succeed in this, we need to “revitalise the tools of non-violence” which can help establish a climate for sustainable solutions. 34th Session of the Human Rights Council. UN Geneva. flickr cc. 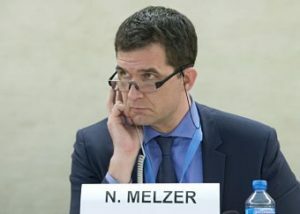 Nils Melzer, the UN Special Rapporteur on Torture and Cruel, Inhuman, and Degrading Treatment, recently presented a damning report to the UN Human Rights Council on the subjection of refugees across the world to torture. 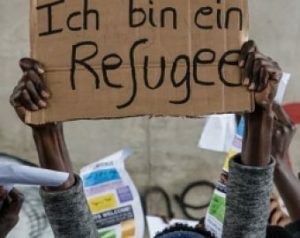 Melzer’s fundamental contention was that the primary cause for the massive abuse suffered by refugees globally is neither migration itself, nor organised crime. Instead, it is the inexorable trend among states to base their official refugee policies on deterrence, detention, and criminalisation, rather than on protection, human rights, and non-discrimination. Such policies vary from country to country, but a clutch of the most harmful may readily be identified. These include repression and detention “designed to discourage new arrivals, the criminalisation and deterrence of irregular arrivals, the separation of family members, inadequate reception conditions and medical care, and the denial or excessive prolongation of status determination or habeas corpus proceedings, including expedited returns in the absence of such proceedings”. As a particularly traumatic form of migration-related confinement, the report singles out long-term, off-shore detention on isolated islands or extra-territorial enclaves. Australia’s harsh asylum policies have been touted as a possible solution to Europe’s so-called refugee crisis. Politicians in the UK, France, Holland, Denmark, Austria and Belgium have advocated for an Australian-style approach aimed at blocking asylum seekers from accessing Europe. But, for a few reasons, Europe should be wary of following this lead. 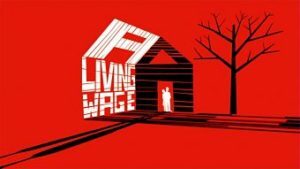 A living wage. Siân for London. flickr cc. If proposed tax cuts are passed, there will either be offsetting increases in taxes elsewhere in the economy, or cuts in public spending in areas such as education and health, or both. If the tax cuts are not passed and you don’t receive a pay rise, don’t blame your boss. Blame the Labor Party. Forget the fact these are salad days for the corporate sector. Forget that, in the past, factors such as productivity, profitability, and company growth were key indicators of affordability of wage rises in industrial and enterprise bargaining. These factors are no longer enough. That’s all in the past. We now live in the neoliberal new world order. 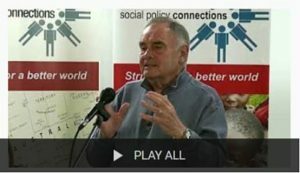 A playlist of Dr Allan Patience’s five foreign policy videos. Associate Professor Allan Patience is a Principal Fellow in the School of Social & Political Sciences at the University of Melbourne. He has recently published Australian Foreign Policy in Asia: Middle Power or Awkward Partner?, examining what kind of `middle power’ Australia is, and whether its identity as a middle power negatively influences its relationship with Asia.